For decades, colleges and universities in the U.S. have been using living animals as their team mascots. While this might start off as innocent fun, this choice has affected the lives of hundreds living beings. Wild and exotic animals are donated, bought or traded for the industry in order to build morale and team spirit to inspire players to win. These animals are brought out for games and publicity events, but the rest of their days are spent locked in enclosures that pale in comparison to their habitats in the wild. Like animals kept in captivity at zoos, these mascots are prone to boredom and deprived of the ability to express their natural behaviors. This can lead to both mental and physical ailments, compounding the misery of these captive beings. These animals are subjected to a life in captivity, all in the name of “tradition.” While many schools have transitioned away from using live animal mascots, a select few have yet to make this compassionate switch. Although all of the live mascots who are kept by these schools are reportedly given the best care possible, we have to contend that even the best care in captivity can never compare to the freedom that these animals deserve to experience in the wild. Lacumba II was a jaguar and the sports team mascot for Southern University and A&M College. At 15 years old and 200 pounds, the jaguar was reported to have died of kidney failure in 2004. Aside from the times when she was wheeled out onto the loud sports fields for games, Lacumba spent the majority of her time locked in a 418 square foot cage. In the wild, jaguars are very active animals and spend their days climbing trees, swimming and hunting for prey. 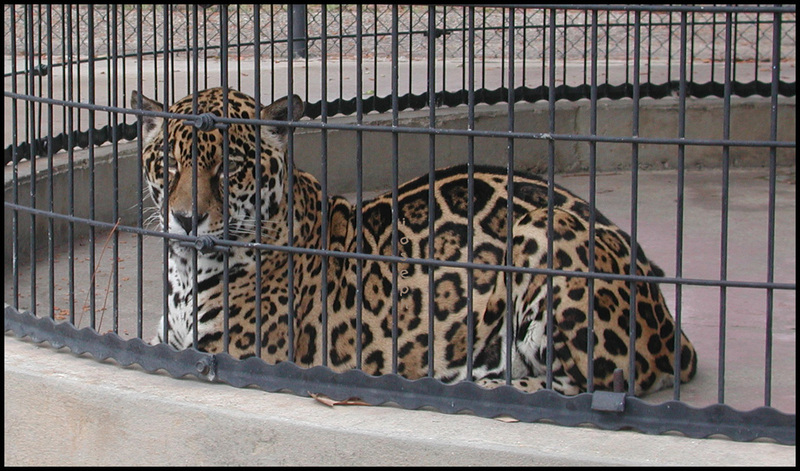 While Lacumba may have reached what is considered “early old age” for jaguars, we can only imagine the extreme boredom and frustration she experienced during her life in captivity. 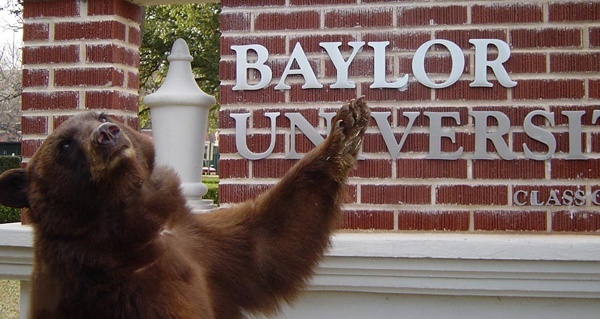 Joy and Lady are two black bears who act as mascots for Baylor University. They have done so for more than a decade now. They are confined to a 3,000 square feet enclosure, much smaller than their roaming grounds in the wild. Investigations by PETA have found that the bears are beginning to suffer from zoochosis, a mental illness that is thought to result from frustration associated with captivity. The two bears have been witnessed pacing, and self-mutilating, both symptomatic of their mental distress. While Baylor no longer brings Joy and Lady out to the field for games and their habitat has improved over the years, it is still a shame that they have been deprived of life in the wild for the purpose of human tradition. The many tigers who have served as “Mike” the Louisiana State University (LSU) mascot illustrate the danger that “tradition” can pose to the well-being of wild animals. For the past 70 years, Mike the tiger has served as the spirit and resolve of LSU. Mike the Tiger was named after Mike Chambers, the athletics trainer at the time of the first Mike, way back in 1936. He was most responsible for LSU attaining Mike as mascot. As fiercely confident, keenly competitive and marvelously clever as LSU may claim their mascots and players are, the legacy of the many Mikes the tiger does not quite lend itself to this. Over the years, six different tigers have served as Mike and although many LSU fans have entreated the school to do away with the tradition, there is little indication that this will ever come to be. The very first Bengal tiger on the college campus was once kidnaped by four Tulane students. Not only would this be a stressful experience for Mike, but it also created a direct public health threat. No matter how long exotic animals are kept in captivity, they are still wild and unpredictable. Mike I died of kidney disease and is now on display at the LSU Natural Sciences Museum. There are rumors that Mike II died of pneumonia just eight months into his reign as mascot and was then secretly replaced with another tiger. This Bengal tiger did, in fact, die of pneumonia. His death was so difficult for the students and staff that the vet at the time, Dr W Sheldon Bivin vowed that another tiger would never die on campus. In 1981, the locks of Mike’s cage were cut, presumably by pranksters, and he managed to roam free for hours before becoming trapped in the Track Stadium. An unsupervised tiger roaming around a college campus is both a danger to himself and college students, posing countless serious health and safety risks. After this traumatic event, Mike lived for 10 more years in his enclosure before he was retired to Baton Rouge Zoo where he died at the age of 20. While Mike V may have been spoiled with a new trailer and renovation to his enclosure, this didn’t bring him any closer to his natural wild surroundings and he died of renal failure. PETA urged LSU not to replace Mike V with another Bengal tiger or any living creature, but they did. LSU claims they chose to continue the live mascot tradition because the tigers they keep live almost twice their natural life span in the wild. We have to wonder whether quality or quantity of life is more important in this situation. Mike VI lives in a brand new renovated enclosure that cost the school around three million dollars. Certainly an improvement on the holding facilities for the previous Mikes, this habitat contains lush vegetation, a waterfall, stream and pond. But it’s still not his home and he is still considered a prop rather than a living, breathing individual. When we look at these cases we must ask ourselves what is the advantage of having a living animal mascot over something as simple as a guy in a suit. Many colleges and universities have mascot suits that provide just as much morale, branding and novelty as a living creature. And most importantly, the guy in the suit chooses to be there. We could all stand to rethink the role that tradition plays in the keeping of live animal mascots and for the sake of these living, sentient beings, set new traditions that do not involve their suffering. Where in the hell do you people get your facts from? This is horrible journalism.